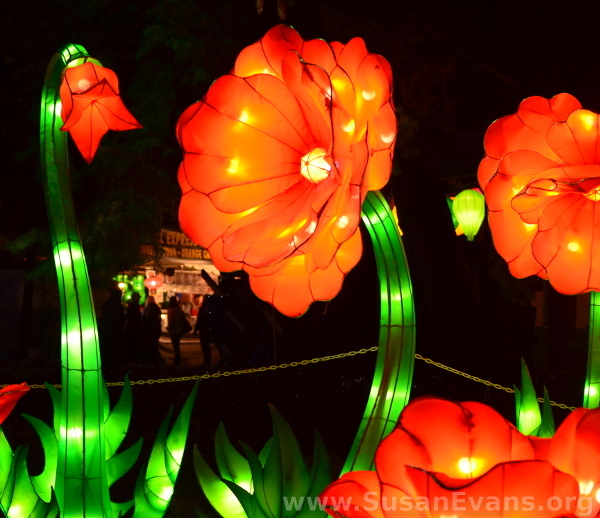 My family attended a super cool Chinese lantern festival here in Spokane, Washington. 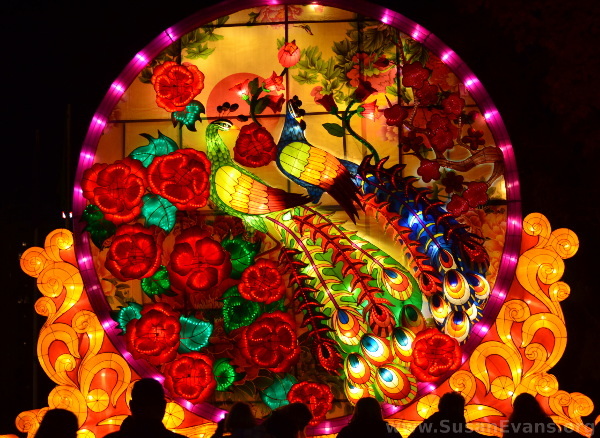 Since the people that put on these shows travel from city to city, you could easily find a Chinese lantern festival in a city near you to attend this year, if you wanted this cultural experience. 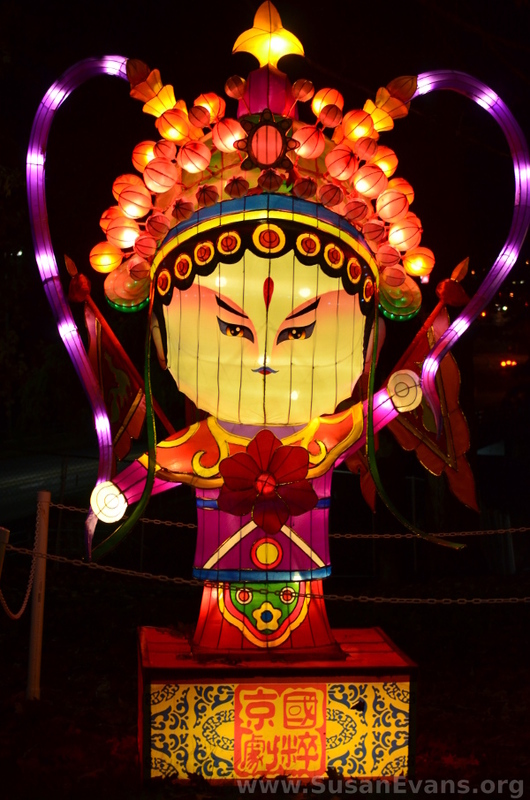 Since I’m a multicultural person myself, I enjoyed taking my children to see the artistic designs of paper and cloth lanterns of various vibrant colors, lighting up the night. The two peacocks were probably the most detailed of all the lanterns. They were standing in the midst of red roses. 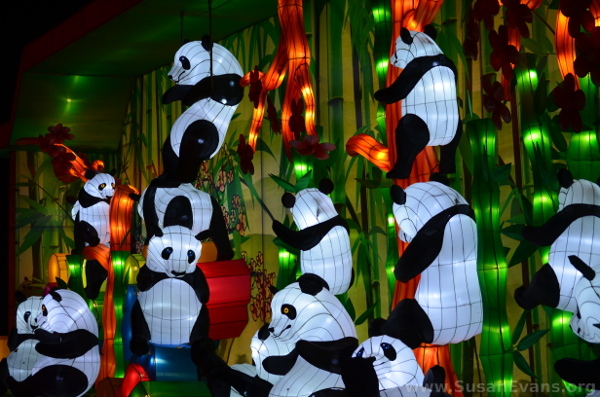 The panda bear display was also spectacular. The bears were hanging in a bamboo forest, which was like a backdrop for the scene. Beautiful orange flowers glowed against the dark night sky. They were enormous! Several Chinese warriors lined one side of the path. Their faces, headdresses, and clothing shone in bright colors. 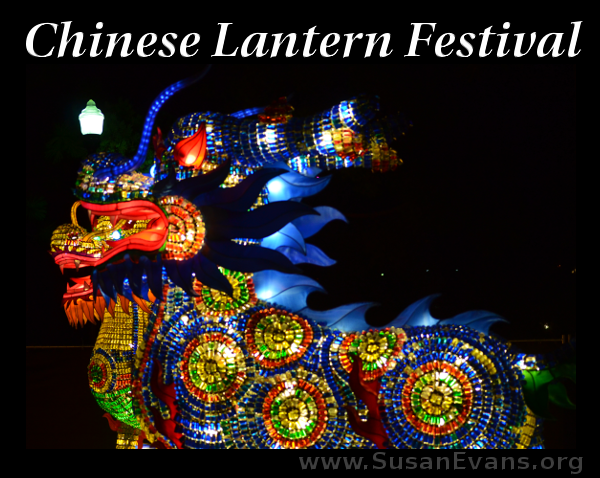 My family walked along a dirt path as we saw this whole Chinese lantern display, which was almost like walking through a city. It also reminded me of driving to see Christmas lights, but way more magnificent. 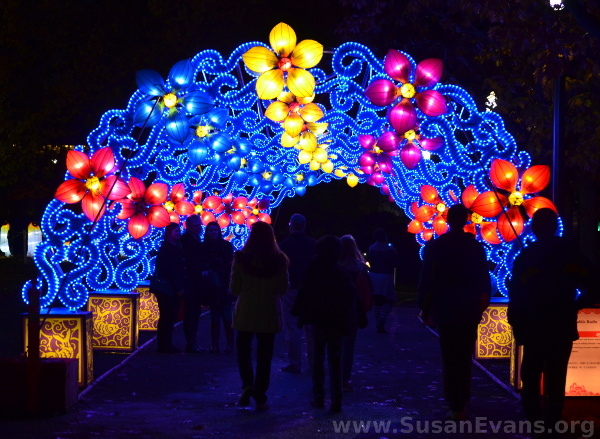 Several arched walkways were lit up thematically. This blue one had flowers and swirls. We felt like we were walking down a tunnel. 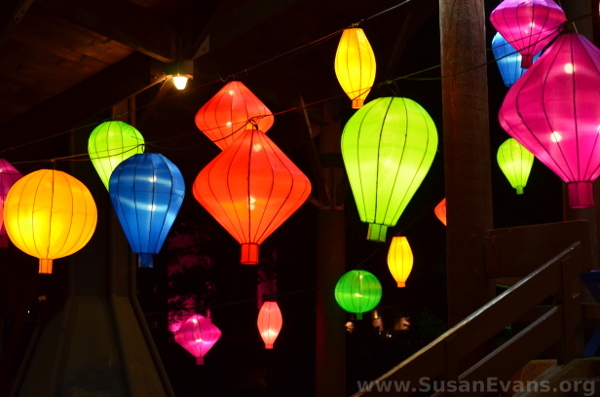 This was my favorite display–a lot of beautiful paper Chinese globe lanterns. 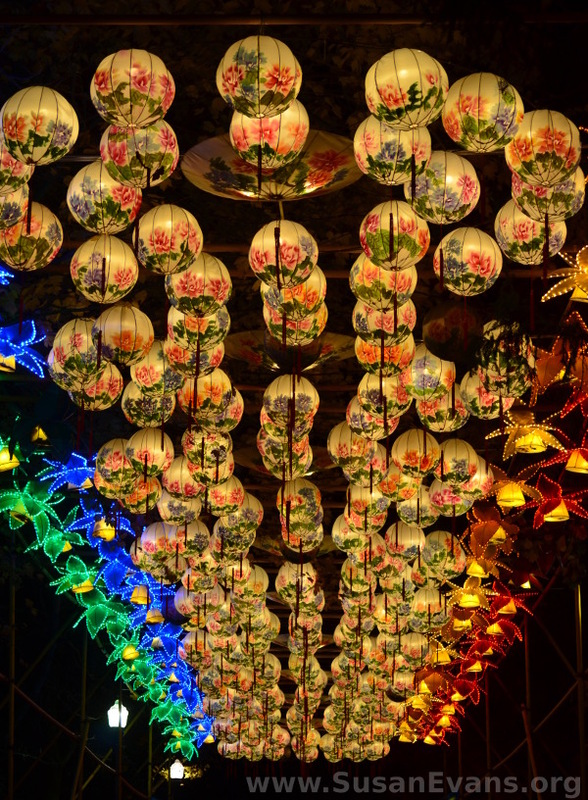 Looking up, you get lost in the beauty of the paper umbrellas and lanterns. My entire family loved this cultural experience! A great geography project for kids to understand the cultures of different countries is to make dolls around the world. Why not have your kids look up the traditional costumes of several countries and sew or hot glue those costumes onto dolls? 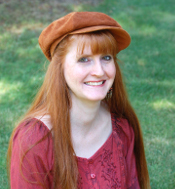 You will want to collect lots of scraps of cloth. If you do this with a school or homeschool co-op, one child can sign up for each country, and you can have the child research the costume for that one country. Then they can write a speech or report to go with their doll, and present it on a geography day! I had always wanted to do this project myself and never had the time. When I saw this homemade dolls around the world set at a resale shop, I was overjoyed that I could show my children the costumes of the different countries while decorating my homeschool room colorfully. If you don’t want to buy so many dolls, you can make dolls out of toilet paper tubes. Just hot glue cloth and beautiful accessories on them, and you can have a less expensive version of the dolls around the world. When I was a teacher in the schools, I assigned a biography for each of my students, and they made a figure of the person beginning with a toilet paper tube. Most of the students’ figures came out gorgeous! Looking at all these dolls makes me want to travel the world! 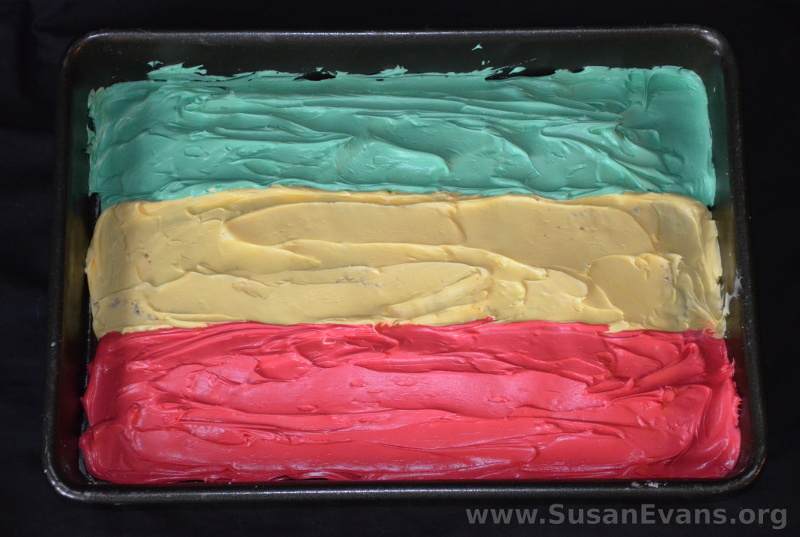 Today I’m going to show you how to make a flag cake. These cakes are super easy to make because they are rectangular-shaped. All you need to do is tint icing the correct colors of the flag, and arrange the top of the cake to look like a country’s flag. Why would you want to decorate a cake as a specific flag? If someone is British, and it’s his birthday, and he happens to be living in the United States, you can make a flag of the United Kingdom to make him smile. 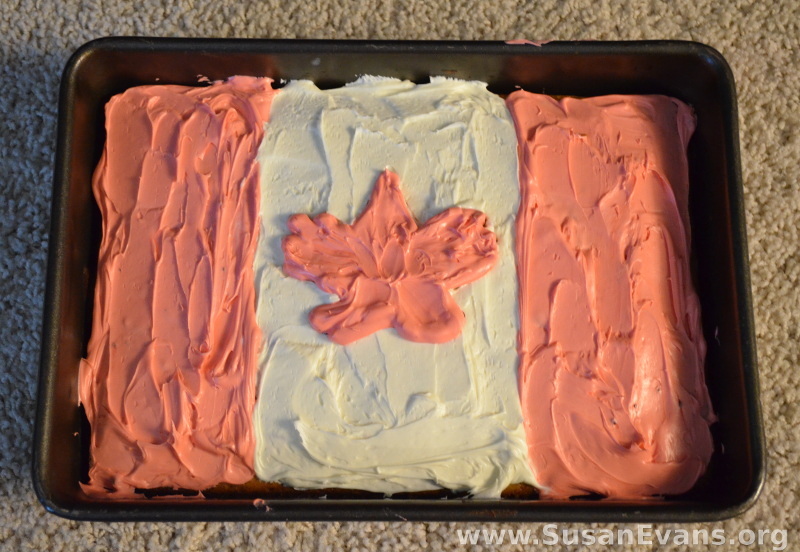 I baked a Canadian birthday cake for my Canadian mother. 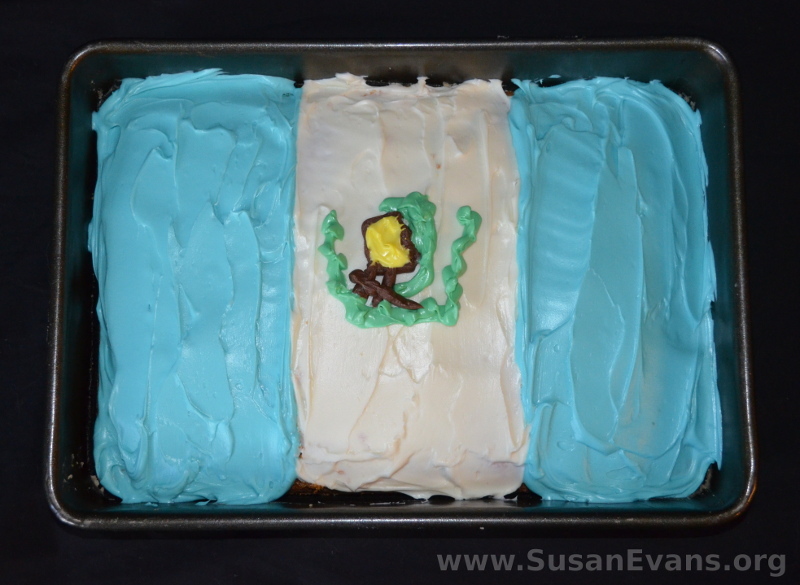 I made a Guatemalan cake for my dad, who was a missionary in Guatemala for 20 years. You can make a cake with Israel’s flag for Christians who love Israel. You can also study a certain country with your children, and make a flag cake for that country, especially if you are homeschooling. First you want to bake a cake in the shape of a rectangle. Cool the cake. Next you will want to grab a tub of vanilla icing. If there are two colors in the flag, you will want to divide the icing into two bowls. Some flags have two thirds of one color, and one third of another color. In this case, you will want to place two thirds of the icing in one bowl, and one third in another. 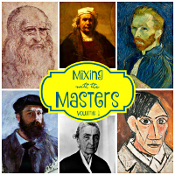 Use food coloring to get to the desired shade of color. Decorate the top of the cake to look as close as possible to the real flag. Grab two tubs of vanilla icing. 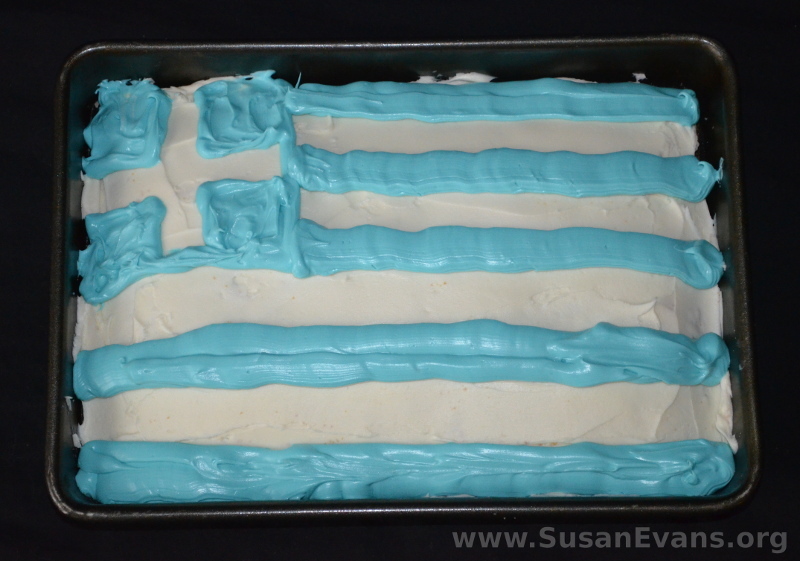 Ice the Greek flag cake completely white. Scoop the second tub of icing into a bowl, and place drops of blue food coloring into it. Stir into the desired shade of blue. In the upper left corner, draw a box with blue icing. I scooped the blue icing into a Ziplock bag with the corner cut off. Then I colored four small squares in each corner of that square, with the result of a white cross left in that corner. Cut the hole larger now in the corner of the bag. Draw the thick blue lines across the remainder of the flag. Divide the icing into three bowls. Tint one bowl green, one bowl yellow, and one bowl red. Frost the cake in thirds. The top is green, the middle is yellow, the bottom is red. I used two tubs of icing for this one. The first tub I tinted blue. I used this to frost the two sides of the cake. The second tub of frosting, I left white. I frosted the middle of the cake. I actually frosted the middle first, before frosting the two blue sides, because it’s easier to put blue on top of white than to put white on top of blue, if you make a mistake. With the remainder of the white frosting, I divided it into three bowls: green, yellow, and brown. I might have used chocolate frosting from a different project for the brown, because it looks too perfect to have been tinted with dye. By the way, when you are dying darker colors, always start with chocolate frosting because then you will need less dye. Put the green frosting in a Ziplock bag and snip off one corner. Make a U-shape to represent the leaves, and draw the quetzal bird in the middle. You could also use candy leaves if you can find them at a cake supply store. This would look better than the version I made. The yellow is the paper, and the brown outlines the paper that the bird is holding in the center of the flag. The other brown strokes are branches. Use Ziplock bags and snip off a tiny hole in each end for these two colors. Once again, I used two tubs of icing, even though I probably could have gotten away with one. I iced the cake white first. I dyed the other icing red, and used that on the two sides. I grabbed my maple leaf cookie cutter, and I pressed it into the middle of the cake. This gave me the outline I needed to fill in the maple leaf with red icing. 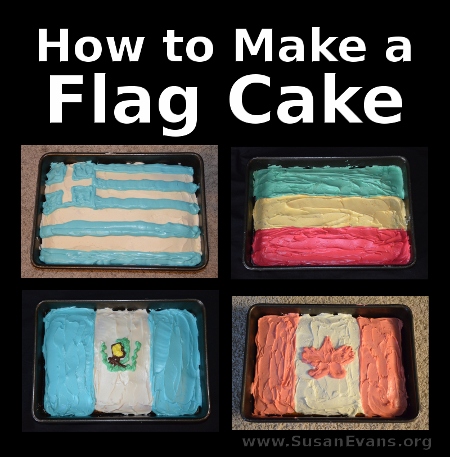 Hopefully now you know how to make a flag cake. Enjoy your creations! If you want more hands-on ideas for teaching geography, grab Living Geography: Travel the World from your Living Room. You can teach your kids about geography, topography, and landscaping through making topography scenes. 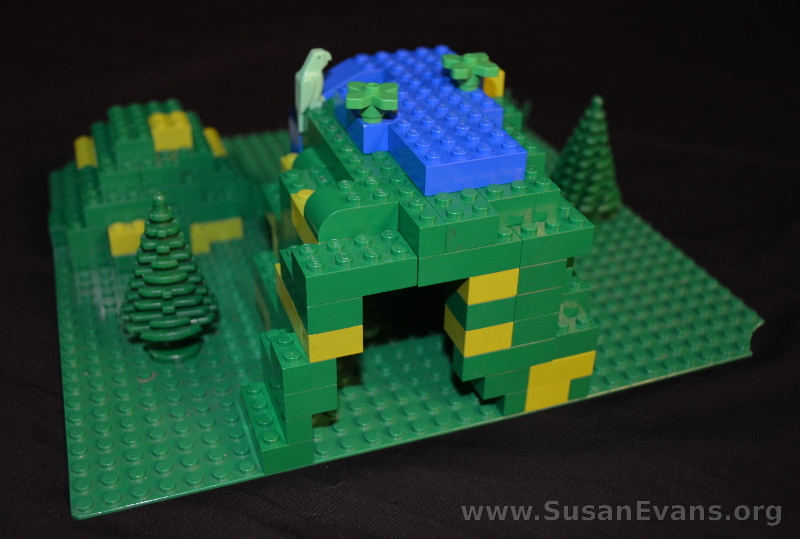 You can choose a real location and re-create it in LEGOs, or you can create your own scene. This is a great activity for learning about geographic terms such as waterfall, fjord, peninsula, cave, volcano, archipelago, delta, glacier, island, mesa, etc. A topographic map uses contour lines to represent three-dimensional features such as mountains. 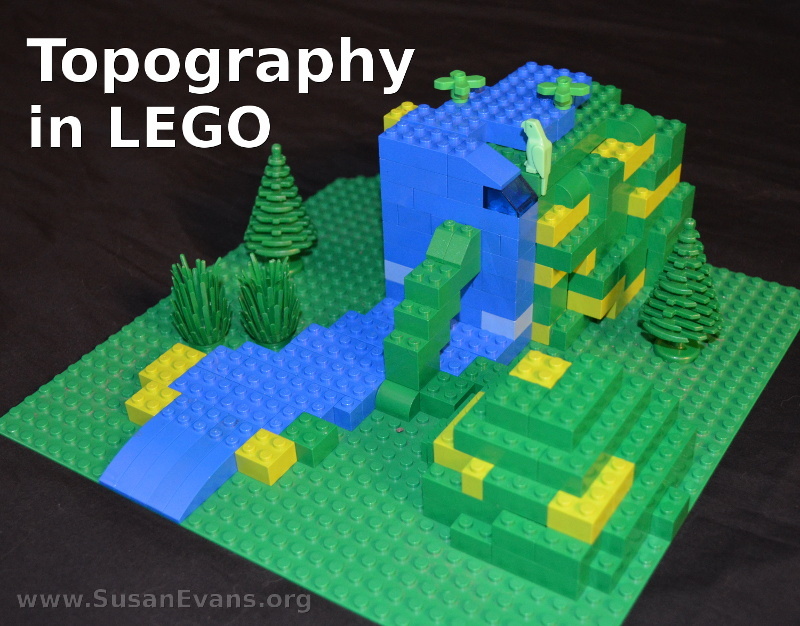 You can teach kids how to read contour maps and have them build the topographic map with LEGOs. You want to start with a green LEGO base representing the lowest area of the map. Build up from there, adding hills, valleys, mountains, volcanoes, etc. 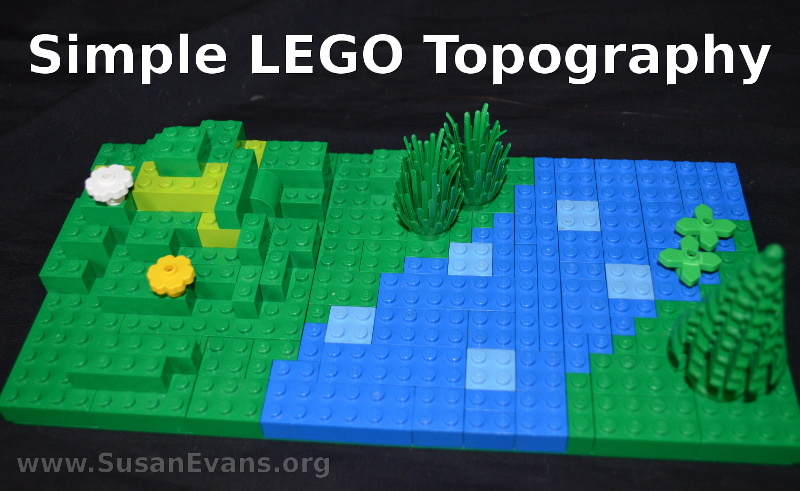 Younger kids can create simpler topographic maps with LEGOs. A river with trees and hills is a perfect starting place. Blue represents water on maps, and green usually represents land that gets plenty of rainfall. Yellow could represent deserts. We created a scene with a mountain and a waterfall. On the back of the mountain my son created a cave. Trees were added to embellish the lushness of the scene. If you enjoyed this hands-on geography activity, you will love the Geography section of the Unit Study Treasure Vault!